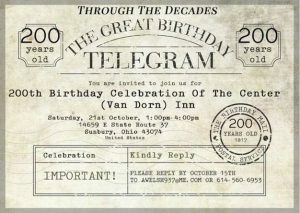 The Big Walnut Area Historical Society, located in Sunbury, Ohio, is celebrating the 200th Anniversary of the Van Dorn Inn in October. You are invited to join our celebration! It will be a great event for both young and old! The old Van Dorn Inn (known as the “Center Inn” or “Vans Valley Inn”) located at the intersection of State Routes 37 and 605, just west of the Licking County line in Delaware County, is celebrating its 200th Anniversary. This home was a part of the Underground Railroad! Built in 1817, it was the first brick building in Delaware County, now listed on the National Historic Register. The Inn has been beautifully restored and updated with artisan finishes throughout the nearly 4,000 square feet, with five fireplaces, five bedrooms, two and a half baths, a formal dining room, library, family room, updated eat-in kitchen, and charming private guest suite. The four+ car garage has a finished living space. Enjoy the lush gardens on the private patio. Fenced yard on 1.44 acre lot with mature trees. This beautiful home was photographed by and featured in “Country Living Magazine” (bottom of this page). We would like to invite you to come see this dramatic home that combines old world charm with elegant country living! Checkout our website and old photos by clicking on the Invite below. For map and directions to the Van Dorn Inn, click here.